As you may know, Vegemite is an Australian food, but over the years it has come to be known as an Australian icon. It is a spread made mainly from concentrated yeast extract that is leftover from the beer brewing process; but don't get your hopes up, that doesn't make it alcoholic. Vegemite's creators recognised that the yeast extract was a very valuable source of vitamins; add to that the various spices and vegetable extracts, and it's creators fulfilled their goals to create a highly nutritional and tasty spread. Vegemite has a solid consistency similar to that of butter, but it's heavier, and it's a very dark brown. HOW POPULAR IS VEGEMITE IN AUSTRALIA? One of the reasons that Vegemite is so widely recognised as an Australian symbol is that it is so loved by Australians. An estimated nine out of ten Australian pantries contain at least one jar of the stuff, while thirty jars of Vegemite are consumed within Australia for every one jar that is exported. 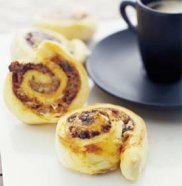 It is extremely common among Aussies to be brought up eating Vegemite on toast for breakfast, Vegemite and cheese sandwiches for lunch, "Cheeseymite scrolls"... and the list goes on. This is because of parents' common knowledge that it's very healthy for growing kids, which stemmed from the huge post-war family growth that created an ideal market for the product. We love our Vegemite! It all began in 1922 at the Fred Walker Cheese Company, in Melbourne, Australia. Fred Walker, founder of the company, wanted to explore the possibilities of the vitamin rich yeast extract that was readily available as a byproduct of brewing beer. He assigned the project to his chief scientist at the time, Dr. Cyril Callister, who ultimately invented Vegemite. Apart from the yeast extract concentrate itself, other ingredients included (and still do) extracts from vegetables such as onion & celery, a malt extract from barley, and salt. At this point, the Walker Cheese Company didn't have a name for their new product, so in an imaginative effort to not only find a name for, but also publicise the product, a national competition was held inviting Australia to think of it themselves. 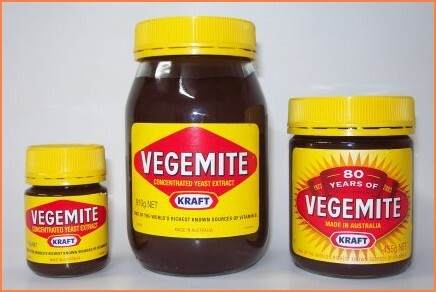 In 1923, in exchange for the generous sum of �50, the name Vegemite was picked and the product hit the shelves. WHAT DOES VEGEMITE TASTE LIKE? For first timers, the flavour of Vegemite is often unexpected. Most common spreads used in sandwiches, but in particular, on toast, is either sweet like jam or honey, or else it's peanut butter! Vegemite however, has a rather salty bite to it. It is often used as a stock in all kinds of cooking, so it's very savoury and can be likened to a concentrated flavour of a dark meat like beef. Yeast Extract, Salt, Mineral Salt (508), Malt Extract (From Barley), Natural Colour (150d)(Contains Preservative 220), Vegetable Extract, Niacin, Thiamine, Riboflavin, Folate. Energy: 37kJ, Protein: 1.2g, Carbohydrate (total): 1.0g, (sugars): less than 1g, Fat (total): nil, (saturated): nil, Niacin: 2500�g(25%RDI), Thiamine: 550�g(50%RDI), Riboflavin: 430�g(25%RDI), Folate: 100�g(50%RDI), Sodium: 153mg. Another quick, easy and tasty snack. 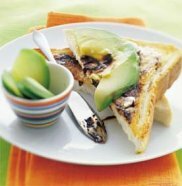 Butter your bread, spread a thin layer of vegemite on it, then add cheddar cheese and lettuce. The sky's the limit! Simply spread a small amount of butter and vegemite (according to taste) on your favorite crackers. Great for brunch or a snack and packed with flavour. 1) SIFT flour and salt into a bowl then rub through butter. Stir in enough milk to make soft dough. Knead gently on a lightly floured surface, and then roll to form a 40cmx 25cm rectangle. 2) SPREAD the Vegemite over the dough then sprinkle over � of the cheese. Roll up along the long side to enclose the cheese. Cut 10 x 4cm pieces from the roll and place close together, cut side up on a greased baking tray. 3) SPRINKLE with the remaining cheese and bake in a hot oven 220C for 15-20 minutes or until cooked and golden.